Katie joined G & G Law as an Attorney in September 2018. Prior to joining G & G Law, Katie worked at a prominent Chicago domestic relations litigation firm, where she represented many business owners through the divorce process. During her time as a domestic relations attorney, Katie honed her client management and business acumen skills through the litigation and negotiation of divorce cases. Katie loves working one-on-one with clients to discover creative solutions to their problems, and she was especially drawn to G & G Law’s vision of expanding access to quality business legal services to the community. Katie graduated from the University of Michigan- Ann Arbor in 2012 with degrees in Political Science and Women’s Studies. 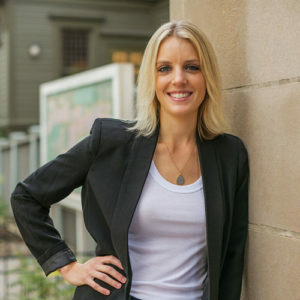 After graduating from Michigan, Katie received a merit scholarship to attend Loyola University Chicago School of Law, where she tutored first-year students in legal writing and received the CALI awards for the highest grades in Legal Writing and Advanced Issues in Domestic Relations Law. Katie was also an editor and contributor to the Public Interest Law Reporter. She graduated in 2015 and was sworn in to the Illinois Bar in November 2015. Katie lives in the Lakeview neighborhood of Chicago and loves it! She also loves sushi, Detroit-style pizza, long bike rides through the city, football season, and the Mitten State (Go Blue! ).